In a previous article, I reminisced about the childhood memories of free food, with 25% free offers available and 50% free packets were common. A practice which is fast dying out as food manufacturers look to counter the rising costs of energy, by reducing the amount they give you for the same or higher prices. Food manufacturers are now facing a double-edged sword with global crop failures in 26 states of the US, Russia, Australia, subcontinental Africa and many other food producing nations. The effects of human-made climate change are as predicted, changing the climate. Who could have anticipated that? The seriousness of what climate change means will only become apparent to most people today when our ability to feed ourselves begins to diminish. Unfortunately, the la-de-da attitude most people have, including our political leaders, is scary. The potential for mass-starvation if global warming continues its worldwide droughts, with 1930’s style dust bowl scenario’s being played out across the four main continents is the real threat from climatic changes. Pumping greenhouse gases into our slim, almost eggshell proportioned atmosphere is the planetary equivalent of putting a thicker toggled duvet on your bed during the height of summer. Things are going to get wetter and hotter, but never just right again. I remember articles in newspapers and magazines discussing the potential to geoengineering for when things get hot here on planet Earth. Well those days are already here, and countries from China to the United States are already trialling ways to counteract the effects and the problems, global heating is already causing to industrial-scale farming and agriculture. So to those who may have been sceptical about unintended human-made climate change, the tide has as already changed in five short years, with people yet again trying to improve his climate intentionally to counteract the effects of his unintended consequences. Cause and effect, the most fundamental laws of physics, have been ignored (some may say deliberately) by our political elite in humanity’s rush to prove his intelligence. I guess this was a schoolboy error, but a schoolboy error with enormous consequences for 80% of biodiversity. I am not a religious person, but for the first time, I have understood that line in the Lord’s Prayer, because, in our modern times, most people have never felt real hunger. We are all just an industrial-scale crop failure away from starvation. Our economic markets are geared up to price most people out of the market should a partial collapse of the industry occur. The real threat to our daily bread is climate change. A year on year drought as currently experienced in Australia for the last ten years is becoming more of reality. Even in our moderate climate here in the United Kingdom, crop failure is occurring, but not via drought, but by long-term water logging in rain-soaked fields. Our current and industrial scale farming practices which give us supermarkets full of food now geared-up to certain levels and tolerances. 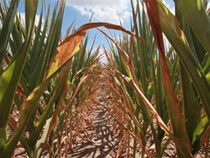 Anything diverging away from the typical weather patterns is critically unsuitable for high-yield crops. The English Riviera climate you were all looking forward to because of climate change, has suddenly become a scary, dangerous threat to our daily lives and our daily bread.